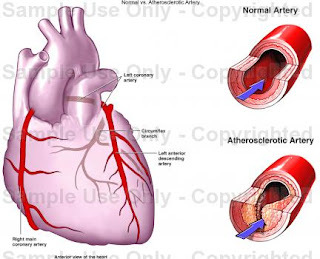 The Green Sanctuary: What is Angina ? 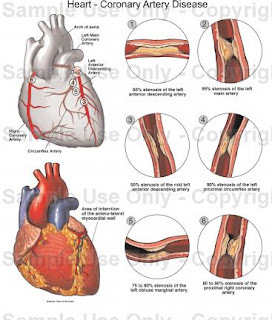 Angina is chest pain caused by restricted blood flow to the heart (called ischemia). It usually occurs when you are under emotional or physical stress (such as exercise). The heart doesn't get enough oxygen from the coronary arteries, and you feel a squeezing chest pain or pressure across your chest, which usually goes away after you stop the activity. 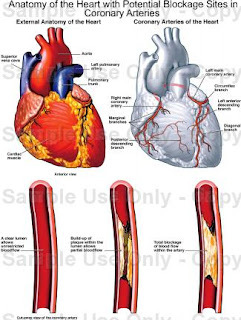 The most common cause of angina is atherosclerosis (hardening of the arteries). Stable angina usually occurs when you exercise and is fairly predictable. It is relieved with rest or nitroglycerin. Unstable angina, on the other hand, can occur when you are resting, or at unpredictable times. It can lead to a heart attack, so if you experience unstable angina you should immediately call 911. It can be difficult to determine whether your chest pain is something serious or whether it is a milder condition. For that reason, you should always see your doctor for a diagnosis and treatment. Angina can lead to a heart attack, so you should never try to diagnose or treat it on your own. Chest pain from angina can feel like pain due to other causes such as heartburn, a muscle strain, or asthma. When in doubt, assume that the pain is related to your heart until proven otherwise, especially if you are experiencing pain that you have never felt before. The classic chest pain from angina feels like significant pressure, squeezing, or tightness in the center of your chest. It has been described as feeling like a band across the chest or a weight pressing down on the chest. You may also feel pain in your left arm and shoulder, neck, and jaw. Other possible feelings include indigestion, rapid or skipping heartbeat, or mild discomfort. Coronary heart disease, which occurs when the arteries leading to the heart become narrowed or blocked by plaque, is almost always the cause of angina. See articles on Atherosclerosis and Heart Attack for more information about risk factors. Your doctor may run several tests to determine the cause of your chest pain. Electrocardiogram (ECG), which records heart activity through electrodes fastened to your chest. Stress test, which measures how your heart performs when you exert yourself. You will be hooked up to an ECG machine and may be asked to exercise (usually on a treadmill or stationary bike), or you may be given a drug that causes your heart to act as it does when you exercise. The stress test also may be done with imaging (like thallium, sestimibi, or an echocardiogram) to look at the blood flow and muscle function of your heart. Coronary catheterization, which examines arteries to see if they are narrowed or blocked, involves injecting a dye into your arteries through a thin catheter. Other tests may include an electron beam computed tomography (EBCT) scan or cardiovascular magnetic resonance imaging (MRI). If you will be doing an activity that usually triggers your angina, your doctor may tell you to take nitroglycerin a few minutes in advance to prevent the pain. In treating angina, your doctor will treat the underlying heart disease to prevent it from getting worse. By doing this, blood flow to the heart improves and angina gets better. Lifestyle changes and certain medications can improve blood flow and make you feel better fairly quickly. Keep track of what causes your angina pain, what it feels like, how often you get it, and how long it lasts. If there's a change in your pattern for the worse (for example, if it happens more frequently or with less exertion), let your doctor know right away. Changing your diet, exercising regularly, and practicing relaxation techniques to reduce your response to stress can help improve blood flow to your heart and reduce angina. These steps can also help treat your risk factors for heart disease. * Eat a variety of nutritious foods from all the food groups, especially whole grains, fruits and vegetables, and low fat dairy products. * Limit sodium intake to 2,300 mg per day. * Limit alcohol intake to 2 drinks per day for men and 1 drink per day for women. * Burn as many calories as you take in. Get at least 30 minutes of exercise most days (or, better still, every day). Relaxation techniques may help you reduce stress, which can be a contributing factor to heart disease, and relieve chest pain. Such practices might include the use of meditation, progressive muscle relaxation, breathing exercises, yoga, self hypnosis, or biofeedback. * Calcium-channel blockers -- slow heart rate and cause arteries to dilate. * Ranolazine (Ranexa) -- used only when other anti angina drugs don't work, due to potential side effects. It is used with other anti-angina medications, such as beta-blockers or nitroglycerin. If lifestyle changes and medications are not effective or if unstable angina develops, you may need coronary artery bypass graft surgery, angioplasty with stent placement, or another type of procedure to improve blood flow to your heart. Eat a well balanced diet with plenty of whole grains, fruits, vegetables, and low fat dairy products. If approved by your physician, make sure you exercise at least 30 minutes a day most days of the week. There are many supplements that can help reduce your chances of developing heart disease and its consequences, including angina. A few supplements are being studied specifically to reduce the pain from angina. However, you should never try to treat angina on your own, and should only take supplements or herbs under your doctor's supervision. The doses given below are ones that have been used in studies; it is important to talk to your doctor about what dose might be best for you. * L-carnitine (1 g 2 times per day), an amino acid, may help reduce symptoms of angina, according to several clinical trials. * Coenzyme Q10 or CoQ10 (150 mg per day) is important for heart health and several studies suggest that taking it may allow people with angina to exercise more without pain. High doses of CoQ10 may interfere with some anticoagulants (blood thinners), so talk to your doctor before taking CoQ10 if you take anticoagulants. * Arginine or l-arginine (2 g 3 times per day) is another amino acid that may improve blood flow and increase exercise tolerance in people with angina. * Magnesium (365 mg 2 times per day) acts similar to a calcium-channel blocker in the body, although it is much weaker. One study suggested it may help reduce chest pain caused by exercise. Magnesium can lower blood pressure and cause diarrhea, so talk to your doctor before taking it. The use of herbs is a time honored approach to strengthening the body and treating disease. Herbs, however, can trigger side effects and can interact with other herbs, supplements, or medications. For these reasons, you should take herbs with care, under the supervision of a health care practitioner. If you have angina, do not take any herbs without your doctor's supervision. * Hawthorn (Crataegus monogyna, 60 mg 3 times per day) has been used traditionally as a to treat heart disease. One small clinical trial suggested that people with angina who took hawthorn improved blood flow to the heart and were better able to exercise without pain. However, the trial was small and more studies are needed. Hawthorn can cause side effects and interact with other drugs, so do not take it without your doctor's supervision. * Kudzu (Pueria lobota, 30 mg - 120 mg per day) has been used in Chinese medicine for centuries to treat heart disease. A few clinical trials have indicated that kudzu may reduce the frequency of angina in people, but the trials were poorly designed. More research is needed. Kudzu can cause side effects and interact with other drugs, so do not take it without your doctor's supervision. * Terminalia arjuna, an herb used in Ayurvedic medicine, was shown in one study to be as effective as isosorbide mononitrate (Imdur) in reducing the number of angina attacks and increasing exercise capacity. However, more studies are needed. * Suxiao jiuxin wan is widely used in China for angina. One study found that suxiao jiuxin wan improved ECG measurements and reduced symptoms and frequency of acute angina attacks compared with nitroglycerin. Homeopathy should never be used instead of immediate medical attention for unstable angina, new onset chest pain, or chest pain that has changed in intensity, frequency, or other characteristics. Homeopathy may, however, be used to help reduce your risk of heart disease, along with other medications. Although few studies have examined the effectiveness of specific homeopathic remedies, professional homeopaths would recommend appropriate therapy to lower high blood pressure and cholesterol. Before prescribing a remedy, homeopaths take into account your constitutional type. In homeopathic terms, a person's constitution is his or her physical, emotional, and intellectual makeup. An experienced homeopath would assess all of these factors when determining the most appropriate remedy for you as an individual. Studies using acupuncture to treat angina have found mixed results. While some show no benefit, others have found that acupuncture may help reduce the frequency of angina attacks and the need to use nitroglycerin. Stable angina can progress and become unstable and even lead to a heart attack. The good news, however, is that with the right treatment including eating proper diet, getting enough exercise, and taking medication, blood flow to the heart can dramatically improve, lessening the likelihood of angina attacks.